“Don’t look overjoyed when a man dates you up. Act as if you could take them or leave them, and it doesn’t matter which to you.” Dorothy Dix, How to Win and Hold a Husband. So let’s say there’s this guy I like. Older guy, blonde, big muscled arms, beautiful lips. 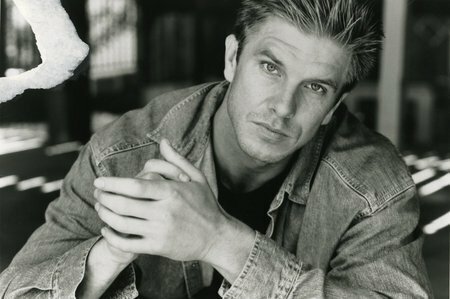 Okay, let’s just say that it’s Kenny Johnson from The Shield and I’ve had a crush on him pretty much since day one. I even watched Major League 3: Back to the Minors so I could look at him in a leotard. Now let’s say I follow him on Twitter, because Twitter allows us to stalk people. And then let’s say, for the fun of it, that he follows me back. And for kicks, we’ll add that it’s just before my birthday and OMG I’M GOING TO FAINT. Now the question is, how on earth do I communicate with this person without sounding like a drooling idiot fangirl? The answer is, I haven’t. All I do is get up every morning to check that he still follows me, try to think of something clever to say (“I want to write a TV show where Kenny Johnson solves crimes with dinosaurs”) erase it and go about my day in a semi-neurotic state (that’s my usual mode and has nothing to do with Kenny Johnson). I’ve never really been good at talking to boys I like. I have two modes: Manic Pixie Dream Girl and Coy Seductress. Mostly Manic Pixie Dream Girl, where I act all weird and goofy and bubbly, and I ask silly questions and make mix CDs because there’s this thing called the 90’s and it’s gonna be around forever. Because more than anything, I want to be liked and I want to be adored. I want to be special to a man, even if it’s just as a friend, and not just another series in dumb forgettable fangirls.